Preheat the oven to 400 degrees F. Toss the bread with 2 tablespoons of olive oil on a baking sheet and season with salt and pepper. Bake until golden, about 8 minutes. Let cool slightly. Whisk the mustard, lemon juice and vinegar in a large bowl and season with salt and pepper. Slowly whisk in the remaining 2 tablespoons of olive oil. Add the tomatoes, scallions, and dill and season with salt and pepper. Add the bread cubes and toss to coat. Set aside while you make the crisps. Toss the cheese with the flour and pepper to taste in a bowl. Arrange the mixture in 4 mounds on the banking sheet and flatten slightly. Bake until golden, about 10 minutes. Cool slightly, then remove with a spatula to a rack and let cool. 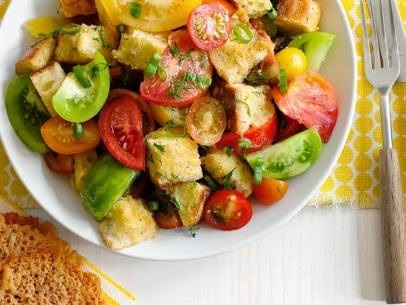 Serve with the tomato salad.